I recently upgraded my primary desktop computer with a new motherboard, CPU, RAM, and video card, so naturally I had to reinstall Windows. 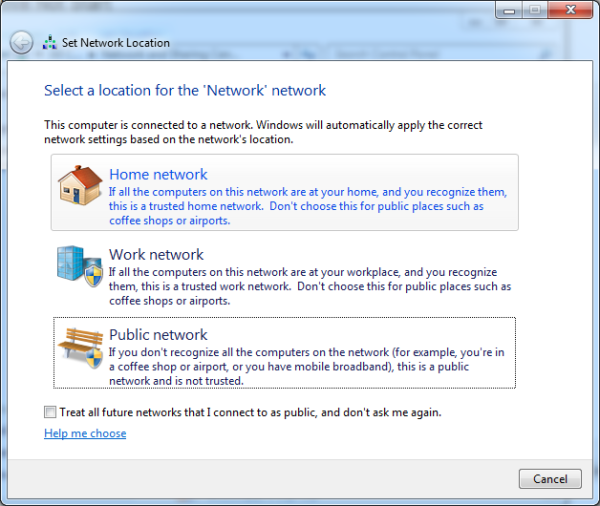 When I booted into Windows and connected to my home network, I was prompted to choose the type of network; I chose Home because, well, it’s my home network. By choosing a network location, you can enable or disable certain functionality, including HomeGroups. Windows will prompt you for the homegroup password when it detects a homegroup on a “Home” network and connects to it. I have a HomeGroup set up on my other computers already, so Windows detected it and asked me for the HomeGroup password. 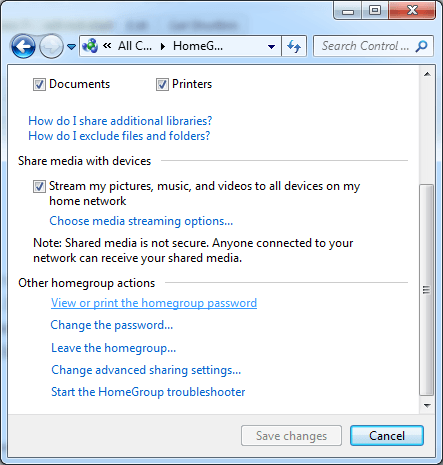 I opened the Network and Sharing Center on my other desktop and went to the HomeGroup settings screen, but when I clicked on View or print the homegroup password nothing happened. 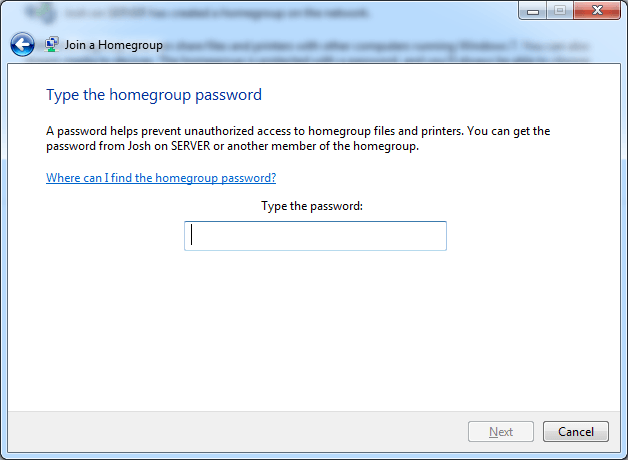 The HomeGroup Settings screen allows you to view the HomeGroup password. After a bit of troubleshooting, I discovered that two of the three Services required for HomeGroups to function were not running. HomeGroup uses Peer Name Resolution Protocol, Peer Networking Grouping, and Peer Networking Identity Manager (in addition to the two HomeGroup services). HomeGroup requires these three services to function. I have previously written about HomeGroups and the services they need to work, but I could not get Peer Networking Grouping started because it has a dependency on the Peer Name Resolution Protocol service; unless it is running (which it wasn’t), Peer Networking Grouping can’t start. 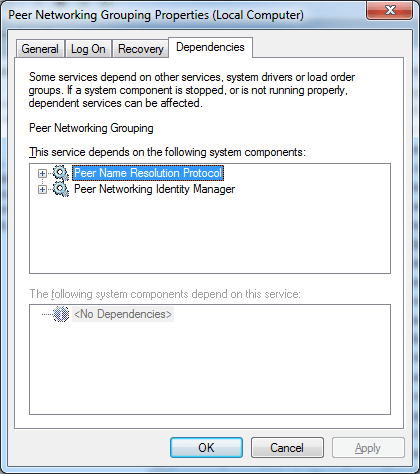 The Peer Networking Grouping service requires that the Peer Name Resolution Protocol and Peer Networking Identity Manager services are running. I tried starting Peer Name Resolution Protocol, but received an error message saying it would not start (along with an error code). Fortunately I found this forum post that provided a solution. I simply deleted the idstore.sst file located in C:\Windows\ServiceProfiles\LocalService\AppData\Roaming\PeerNetworking\. Once the file was deleted, I tried starting the Peer Name Resolution Protocol again. It re-created the file automagically and started up just fine. Then I started the Peer Networking Grouping service without any issues. Thank you for this article! It is exactly what I needed to get the homegroup working on one of my computers! Thank you the services problem were fi xed. But have traubnle setting a Homework in two PC. Something regarding Firewall but is enough for today.